In January 2009, the media narrative in the U.S. favored increasing the number of troops in Afghanistan, bending the public opinion in favor of the same. Understanding the national catastrophe waiting in the wings if lives and scarce national resources were wasted on a military "fix" to a political problem, Brave New Foundation launched Rethink Afghanistan. 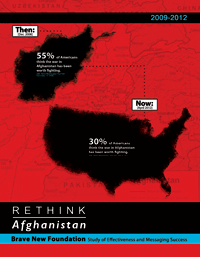 Our latest report Rethink Afghanistan: Study of Effectiveness and Messaging Success details the goals of our campaign and how the campaign was ultimately successful. We launched this campaign to convince the public and policymakers that escalation would not make us safer and was not worth the costs. Three years later only 30% of Americans now believe that the Afghanistan War has been worth fighting. Thank you to our donors and activists who helped make all of this possible. Please help us continue the conversation with our new campaign War Costs. We need your support to put renegade defense spending to an end.